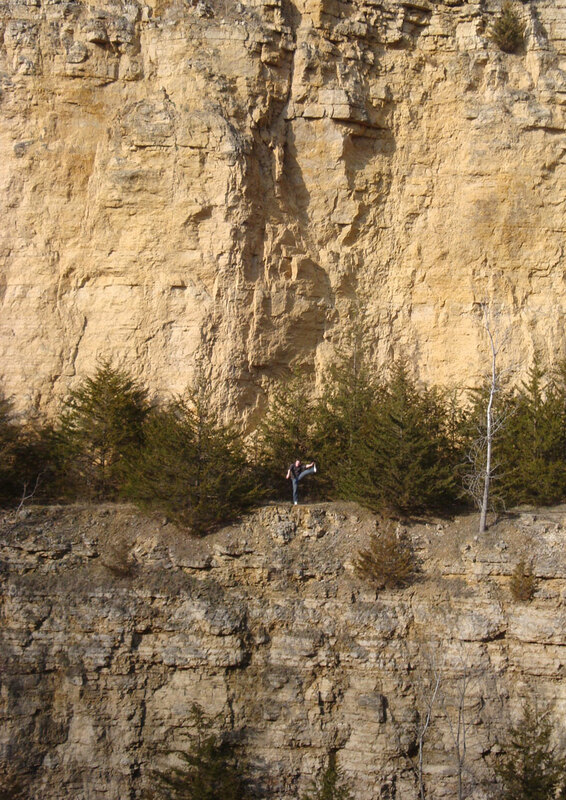 Just south of Dubuque, IA lies Mines of Spain State Recreation Area. This land was mined for lead for centuries, first by the Mesquakie tribe, then by European settlers – most notably French Canadian fur-trader Julien Dubuque. Under Spanish rule he established a settlement (now his namesake city) and continued mining and trading in the area. Mining ceased in 1914 and the 1380-acre park was designated a State Recreation Area in 1981. It offers both hiking and cross-country skiing trails, wildlife watching opportunities, and great views of the Mississippi. The park also features the Julien Dubuque Monument: having married Mesquakie Indian Chief Peosta’s daughter Potosa, Dubuque was buried here with tribal honors in 1810. This entry was posted in High Kick Photos and tagged Dubuque IA, High Kick, Julien Dubuque, Mine of Spain. Bookmark the permalink.